I went to a fantastic talk by David Baddiel on Fame at The School of Life on Sunday. As I’m writing this I recognise that there are people out there who actually don’t know who he is! Look him up as he’s definitely a part of my misspent youth. It was interesting on many fronts to hear from someone who was once very famous, then became even more famous, then less so, and is finally now infamous. He described how his fame had in many ways got the better of him. Mostly from people shouting abuse at him from across a Sainsbury’s carpark. But what was really interesting was his description of fame. “A mask that you wear that set fast to your face. It looks and sounds like you, but no matter who ‘you’ are underneath, the mask does its best to hide your true self”. This comment got me thinking about branding, both on a personal level in the case of fame, and on a corporate level. We all wear ‘masks’ that are hard to influence no matter what we do personally. Pondering this I realised there are three levels of fame. The ‘you’ the the world sees, the ‘you’ that you want the world to see, and the actual ‘you’ right at the centre like a caramel nugget. The same applies to corporate branding. The ‘brand’ that the world sees in terms of campaigns and logos. The brand identity that sits beneath it as in what you want the world to think about you. And finally the actual brand at the centre which focuses on the long term vision, the people who work there, the product and service you’re delivering. What’s frustrating about all of this is just how hard it is to change those masks at any level. You can wriggle and squirm but ultimately the outside world needs to repeatedly access touch points of the brand through every level to even begin to appreciate who you really are. But the great news is that so long as you start to think in these terms of levels of fame or brand, you can slowly start to change the public opinion of you. But it’s a long term process. So what does this mean for the Kim Kardashian’s of this world? Have a plan and stick to it. Look at Matthew McConaughey, at one point his career was stuck in a downward spiral of endless rom-coms. But now he’s reinvented himself through the excellent True Detectives and Dallas Buyers Club. Or Apple, sorry to have to use this example, but when I was an art student the Mac had been resigned to the scrapheap of computers but then something amazing happened. The iMac born and the rest as they say is history. Both of these examples were derived from a real conscious decision to change who and what they were. 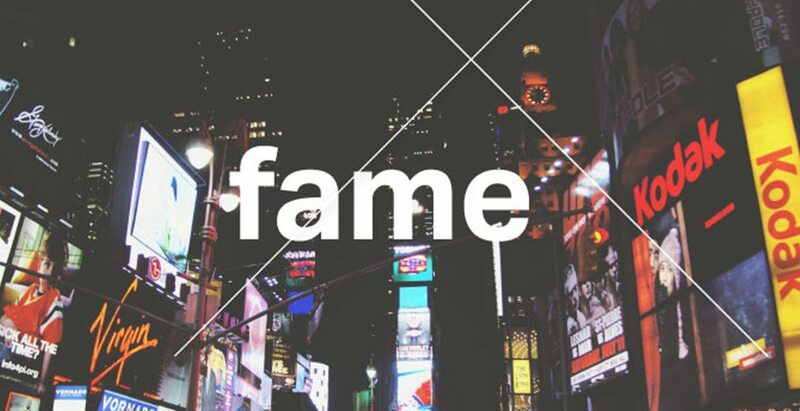 Fame is really another word for branding. It’s a way for the world to understand who and what you are and what you stand for. The good news is that it’s really up to you to take the reigns and take control of your own fame. In his talk David, we’re on first name terms now, spoke about the moment of clarity he had when he realised that he wasn’t what the rest of the world thought he was. His fame had become a beast out of control. What the likes of the Observer looked down and defined as lad-culture. This couldn’t have been farther from the truth. Fast forward 15 years and he’s now a successful novelist, a screen writer and father of two. And from what I could tell a thoroughly nice bloke. Rebrand achieved.